As a means of judging whether the Crafty palate is travelling OK or in need of some serious fine-tuning (or, perhaps, a career change), there's a policy within the Towers of first sampling a beer without reference to any label or brewer's notes, if at all possible. This way, notes can be made upon the basis of nothing more than the senses, then compared with the intentions and descriptions of the brewer. 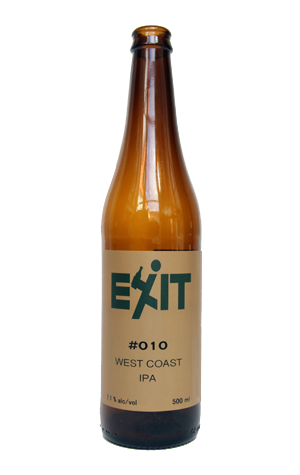 In the case of Exit's West Coast IPA, said sampling notes were short and to the point: "Pale, lean, dry, piney. Driving bitterness ensures malt doesn't get a look in." Thus it was with some relief that when the bottle of #010 was examined, Frase and Grum's label notes describe how they've decided to abandon their goal of balance in all beers this time in favour of "One dimension. Hops." They sign off: "If you don't like hops, walk away now and don't make eye contact."